WALTHAM, Mass., April 26, 2018 — (PRNewswire) — A new series of entry-level, automated potentiometric laboratory-grade titrators has been designed to make titrations easier, more reliable and more accurate than manual alternatives, across a wide range of QC/QA applications within food and beverage, drinking water, wastewater, chemical and petrochemical, personal care, agriculture and academic markets. 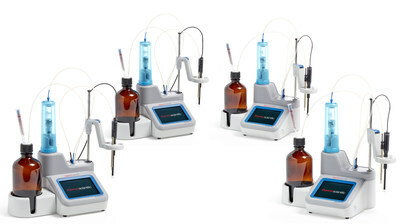 The new Thermo Scientific Orion Star T900 Series consists of four automated titrators, three designed to enable dedicated pH, redox or ion potentiometric measurements, and one all-in-one unit that consolidates the analyses of all three parameters for additional flexibility within a single device. As automated systems, these titrators facilitate easy and intuitive setup and operation, regardless of experience level, while accelerating turnaround times for improved laboratory efficiency and productivity. The potential for human error is minimized, providing confidence that reliable results can be obtained to confirm sample quality and suitability for intended use of the material. "Close monitoring of quality parameters in water, solid and semi-solid samples is critical to determining they are safe for use and won't negatively impact human and animal health, or the environment," said Amit Agarwal, vice president and general manager, water and laboratory products, Thermo Fisher Scientific. "Following World Earth Day, we are especially proud to be able to extend our expertise in electrochemistry and offer our customers this new series of titrators to enable them to verify the quality of their products, and contribute to the protection of life and our planet." Equipped with a large 5.7-inch color touch-screen display, the Orion Star T900 Series enables quick and easy reading of results, while a multi-lingual interface further enhances usability. Analytical methods can be customized to meet varying application needs, while up to ten methods can be saved within the system to support repeatable titration procedures without the need to repeat setup. Methods can also be transferred to a USB drive for backup and sharing across multiple titrators, for example, when a system needs to undergo routine maintenance. A data storage capability allows users to maintain a history of sample measurements for future reference, while saved data can be easily exported. The new titrators are available with the Thermo Scientific ROSS pH electrodes and Thermo Scientific Orion ion selective electrodes, which offer measurement stability, rapid results and precision for the most challenging samples. For more information, please visit http://www.thermofisher.com/t900titratorseries.